This article is about the letter of the alphabet. For other uses, see L (disambiguation). Not to be confused with ǀ.
L (named el /ɛl/ )  is the twelfth letter of the modern English alphabet and the ISO basic Latin alphabet, used in words such as lagoon, lantern, and less. A letter is a grapheme in an alphabetic system of writing. It is a visual representation of the smallest unit of spoken sound. Letters broadly correspond to phonemes in the spoken form of the language, although there is rarely a consistent, exact correspondence between letters and phonemes. The ISO basic Latin alphabet is a Latin-script alphabet and consists of two sets of 26 letters, codified in various national and international standards and used widely in international communication. They are the same letters that comprise the English alphabet. In phonetic and phonemic transcription, the International Phonetic Alphabet uses ⟨l⟩ to represent the lateral alveolar approximant. The International Phonetic Alphabet (IPA) is an alphabetic system of phonetic notation based primarily on the Latin alphabet. It was devised by the International Phonetic Association in the late 19th century as a standardized representation of the sounds of spoken language. The IPA is used by lexicographers, foreign language students and teachers, linguists, speech-language pathologists, singers, actors, constructed language creators and translators. In English orthography, ⟨l⟩ usually represents the phoneme /l/ , which can have several sound values, depending on the speaker's accent, and whether it occurs before or after a vowel. The alveolar lateral approximant (the sound represented in IPA by lowercase [l]) occurs before a vowel, as in lip or blend, while the velarized alveolar lateral approximant (IPA [ɫ]) occurs in bell and milk. This velarization does not occur in many European languages that use ⟨l⟩; it is also a factor making the pronunciation of ⟨l⟩ difficult for users of languages that lack ⟨l⟩ or have different values for it, such as Japanese or some southern dialects of Chinese. A medical condition or speech impediment restricting the pronunciation of ⟨l⟩ is known as lambdacism. English orthography is the system of writing conventions used to represent spoken English in written form that allows readers to connect spelling to sound to meaning. Japanese is an East Asian language spoken by about 128 million people, primarily in Japan, where it is the national language. It is a member of the Japonic language family, and its relation to other languages, such as Korean, is debated. Japanese has been grouped with language families such as Ainu, Austroasiatic, and the now-discredited Altaic, but none of these proposals has gained widespread acceptance. Chinese is a group of related, but in many cases not mutually intelligible, language varieties, forming the Sinitic branch of the Sino-Tibetan language family. Chinese is spoken by the ethnic Chinese majority and many minority ethnic groups in China. About 1.2 billion people speak some form of Chinese as their first language. In English orthography, ⟨l⟩ is often silent in such words as walk or could (though its presence can modify the preceding vowel letter's sound), and it is usually silent in such words as palm and psalm; however, there is some regional variation. ⟨l⟩ usually represents the sound [l] or some other lateral consonant. A lateral is consonant in which the airstream proceeds along the sides of the tongue, but it is blocked by the tongue from going through the middle of the mouth. An example of a lateral consonant is the English l, as in Larry. Common digraphs include ⟨ll⟩, which has a value identical to ⟨l⟩ in English, but has the separate value voiceless alveolar lateral fricative (IPA [ɬ]) in Welsh, where it can appear in an initial position. In Spanish, ⟨ll⟩ represents [ʎ], [j], [ʝ], [ɟʝ], or [ʃ], depending on dialect. A palatal lateral approximant or palatal ⟨l⟩ (IPA [ʎ]) occurs in many languages, and is represented by ⟨gli⟩ in Italian, ⟨ll⟩ in Spanish and Catalan, ⟨lh⟩ in Portuguese, and ⟨ļ⟩ in Latvian. The capital letter L is used as the currency sign for the Albanian lek and the Honduran lempira. It was often used, especially in handwriting, as the currency sign for the Italian lira. It is also infrequently used as a substitute for the pound sign (£), which is based on it. "ℓ" redirects here. For the azimuthal quantum number, see azimuthal quantum number. In some fonts, the lowercase letter ⟨l⟩ may be difficult to distinguish from the digit one ⟨ 1 ⟩, or an uppercase letter ⟨ I ⟩. In recent times, many new fonts have curved the lowercase form to the right. It is increasingly common, especially on European road signs and advertisements, to use a script or cursive, handwriting-style character (e.g. l). A special letter-like symbol ⟨ℓ⟩ is sometimes used for this purpose in mathematics and elsewhere. In Japan, for example, this is the symbol for the liter. Its LaTeX command is \ell. In Unicode it is U+2113ℓSCRIPT SMALL L (with a numeric character reference of &#8467;). however, this glyph has been deprecated by the SI.  . Another solution sometimes seen in Web typography is to use a serif font for "lower-case ell" in otherwise sans-serif material (1 l). 1Also for encodings based on ASCII, including the DOS, Windows, ISO-8859 and Macintosh families of encodings. D is the fourth letter of the modern English alphabet and the ISO basic Latin alphabet. M is the thirteenth letter of the modern English alphabet and the ISO basic Latin alphabet. N is the fourteenth letter in the modern English alphabet and the ISO basic Latin alphabet. O is the 15th letter and the fourth vowel in the modern English alphabet and the ISO basic Latin alphabet. R is the 18th letter of the modern English alphabet and the ISO basic Latin alphabet. S is the 19th letter in the Modern English alphabet and the ISO basic Latin alphabet. T is the 20th letter in the modern English alphabet and the ISO basic Latin alphabet. It is derived from the Semitic letter taw via the Greek letter tau. In English, it is most commonly used to represent the voiceless alveolar plosive, a sound it also denotes in the International Phonetic Alphabet. It is the most commonly used consonant and the second most common letter in English-language texts. Ll/ll is a digraph which occurs in several natural languages. Ezh, also called the "tailed z", is a letter whose lower case form is used in the International Phonetic Alphabet (IPA), representing the voiced postalveolar fricative consonant. For example, the pronunciation of "si" in vision and precision, or the "s" in treasure. See also Ž, the Persian alphabet letter ژ and the Cyrillic ж.
Eng or engma is a letter of the Latin alphabet, used to represent a velar nasal in the written form of some languages and in the International Phonetic Alphabet. Esh is a character used in conjunction with the Latin script. Its lowercase form ʃ is similar to a long s ſ or an integral sign ∫; in 1928 the Africa Alphabet borrowed the Greek letter Sigma for the uppercase form Ʃ, but more recently the African reference alphabet discontinued it, using the lowercase esh only. The lowercase form was introduced by Isaac Pitman in his 1847 Phonotypic Alphabet to represent the voiceless postalveolar fricative. It is today used in the International Phonetic Alphabet, as well as in the alphabets of some African languages. The character ⟨ʔ⟩, called glottal stop, is an alphabetic letter in some Latin alphabets, most notable in several languages of Canada where it indicates a glottal stop sound. Such usage derives from phonetic transcription, for example the International Phonetic Alphabet (IPA), that use this letter for the glottal stop sound. The letter derives graphically from use of the apostrophe ⟨ʼ⟩ for glottal stop. 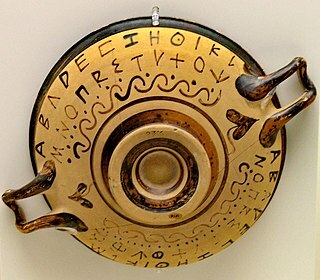 Ou is a ligature of the Greek letters ο and υ which was frequently used in Byzantine manuscripts. This ligature is still seen today on icon artwork in Greek Orthodox churches, and sometimes in graffiti or other forms of informal or decorative writing. Latin epsilon or open e is a letter of the extended Latin alphabet, based on the lowercase of the Greek letter epsilon (ε). It occurs in the orthographies of many Niger–Congo languages, such as Ewe, Akan, and Lingala, and is included in the African reference alphabet. Latin alpha or script a is a letter of the Latin alphabet, based on one lowercase form of a, or on the Greek lowercase alpha (α). Turned A is a symbol based upon the letter A. ↑ "L" Oxford English Dictionary, 2nd edition (1989) Merriam-Webster's Third New International Dictionary of the English Language, Unabridged. (1993); "el", "ells", op. cit. ↑ "Ancient Hebrew Research Center" . Retrieved 12 January 2015. ↑ Gordon, Arthur E. (1983). Illustrated Introduction to Latin Epigraphy. University of California Press. p. 44. ISBN 9780520038981 . Retrieved 3 October 2015. ↑ "Letterlike symbols". Charts (Beta). Unicode Consortium . Retrieved 28 July 2017. ↑ Everson, Michael; et al. (2002-03-20). "L2/02-141: Uralic Phonetic Alphabet characters for the UCS" (PDF). ↑ Ruppel, Klaas; Aalto, Tero; Everson, Michael (2009-01-27). "L2/09-028: Proposal to encode additional characters for the Uralic Phonetic Alphabet" (PDF). ↑ Cook, Richard; Everson, Michael (2001-09-20). "L2/01-347: Proposal to add six phonetic characters to the UCS" (PDF). ↑ Everson, Michael (2006-08-06). "L2/06-266: Proposal to add Latin letters and a Greek symbol to the UCS" (PDF). ↑ Constable, Peter (2004-04-19). "L2/04-132 Proposal to add additional phonetic characters to the UCS" (PDF). ↑ Everson, Michael; Baker, Peter; Emiliano, António; Grammel, Florian; Haugen, Odd Einar; Luft, Diana; Pedro, Susana; Schumacher, Gerd; Stötzner, Andreas (2006-01-30). "L2/06-027: Proposal to add Medievalist characters to the UCS" (PDF). ↑ Everson, Michael; Dicklberger, Alois; Pentzlin, Karl; Wandl-Vogt, Eveline (2011-06-02). "L2/11-202: Revised proposal to encode "Teuthonista" phonetic characters in the UCS" (PDF).